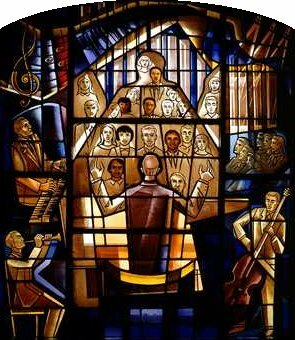 Before 1967, the windows of the sanctuary of the New York Avenue Presbyterian Church were made of simple deep amber glass. 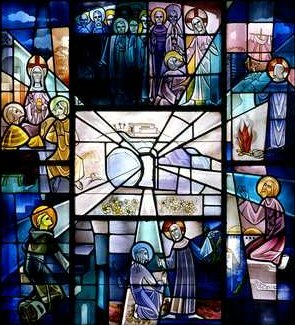 At the instigation and inspiration of the then-Senior Pastor, Dr. George M. Docherty, the congregation committed itself to the design, execution and installation of 19 stained glass windows, nine at the sanctuary floor level and ten in the sanctuary balcony. 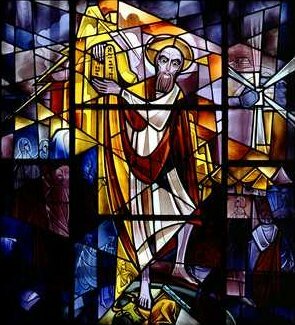 The floor-level windows convey the sweep of the Biblical record from the Creation and Fall through the Church Triumphant. 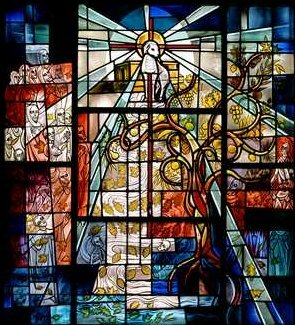 The balcony windows, anchored in the witness of the faith, detail the “cloud of witnesses”, our contemporaries or near-contemporaries who have ventured forth as educators, scientists, political leaders, soldiers, laborers, and musicians. Creation and the Fall: “God said, ‘Let there be light!’” Here light is broken up into the spectrum and radiates from the center in six concentric circles, one for each day of creation. Each day’s work is reflected in the manifestations of creation that ring the center. Here, too, Adam and Eve reject God’s love, Adam with clenched fist, Eve with her hand on the fruit. Moses and the Law: Moses descends Mt. Sinai, his face shining in reflected glory from his encounter with God. As he comes down, he sees his people worshipping false gods and tramples the idols underfoot. The Prophets: It has been said that the prophets are “the beating hearts of the Old Testament”. Here Isaiah, Micah and Amos call the people of Israel to renewed faith and justice. Towering skyscrapers remind us that the prophetic word must still be spoken. 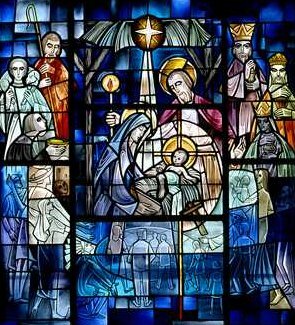 Nativity: “And Mary gave birth to her first born son and wrapped him in swaddling cloths and laid him in a manger.” The shepherds, the wise men and all humanity, past and present, approach the bed. 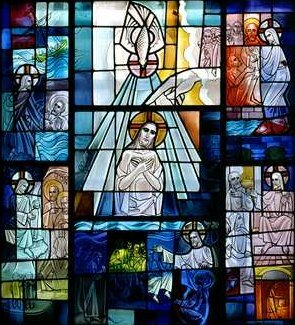 The Baptism and the Teaching and Healing Ministry of Jesus: The central panel depicts the baptism of Jesus in the waters of the Jordan. The mystery of the Trinity is evoked by the hand of the Father, the dove of the Spirit and the Incarnate Son of God. 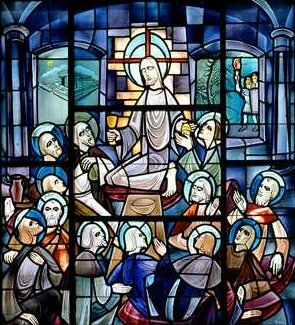 Surrounding the baptism are various events in the teaching and healing ministries of Jesus are depicted. Last Supper: Jesus shares the Last Supper with his disciples. The faces of the disciples reveal their anxiety and bewilderment. Their hands betray their willingness or unwillingness to accept the Eucharistic meal. The pitcher and towel of servanthood lay nearby. Resurrection: The light from the empty tomb suffuses every dark corner of existence. 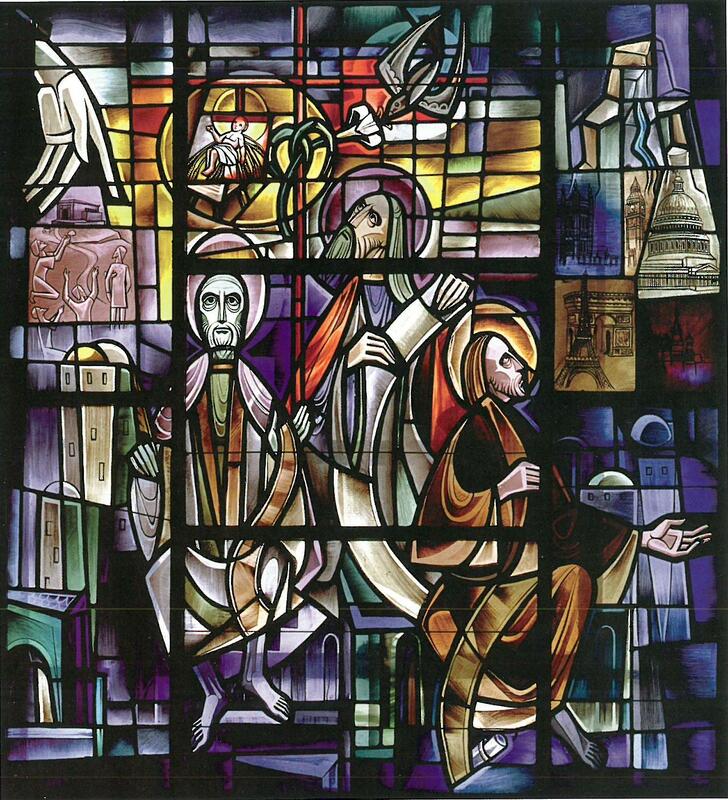 The risen Christ appears to Mary in the Garden, to the disciples in the Upper Room, on the way to Emmaus, by the Sea of Tiberius, to Saul and, then, by insight, to Martin Luther. 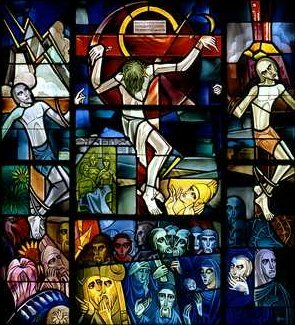 Science: The challenge of atomic energy, both its potential for service to humanity and for horrific destruction, forms the center of this window. 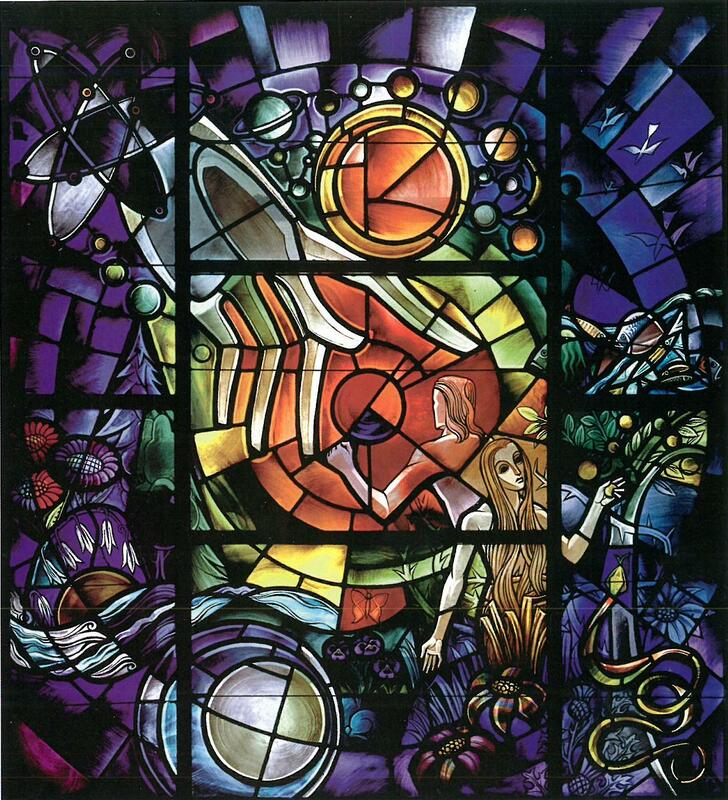 Figuratively, the window captures where spirit and matter, cross and science meet. 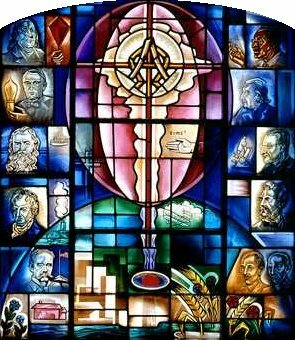 Gathered around that symbol are some of the giants of American science and invention, Albert Einstein, Jonas Salk, Benjamin Franklin, the Wright brothers, George Washington Carver, Robert Fulton, Samuel F.B. Morse, Robert Perry, Alexander Graham Bell and Thomas Edison. Education: St. Anselm described the Christian life as “faith seeking understanding”. 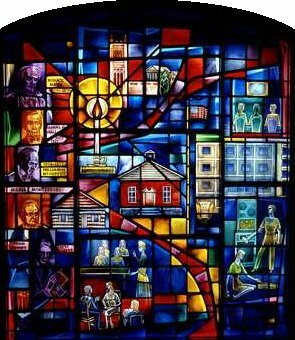 The Education window depicts the evolution of education in America from the one-room schoolhouse to the towers of today’s universities, honoring along the way some of the pioneers of education, among them, Horace Mann, Maria Montessori and John Dewey. 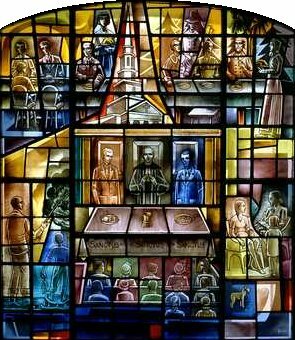 The Family and Thanksgiving: This window portrays three meals, the Thanksgiving meal shared by the pilgrims and the Indians, another Thanksgiving shared by a modern American family and a Eucharistic meal offered at the New York Avenue Presbyterian Church. 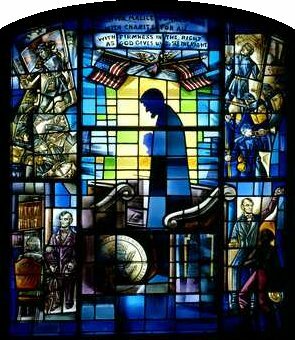 The Lincoln Window: President Abraham Lincoln stands as he prays, as was his custom when he worshipped at the New York Avenue Presbyterian Church. That moment of quiet reflection contrasts sharply with the tumult of war depicted on either side of him. The caption above his head captures the electrifying and profound words of his Second Inaugural Address. 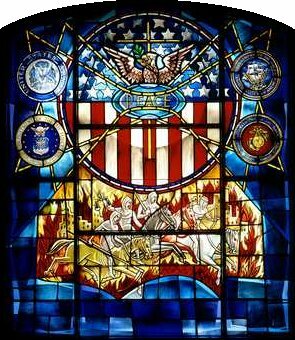 The Armed Forces: This window dedicated to those who have served or are serving in the Armed Forces portrays the horrors of war through the Four Horsemen of the Apocalypse. The church, while honoring those who have served their country in peace and war, must stand in the tension of God’s judgment on all war. 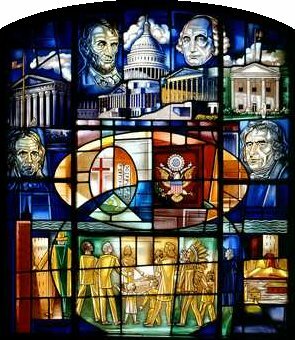 One Nation Under God: This window conveys the contributions of all the many races, nationalities and faiths that call America home. 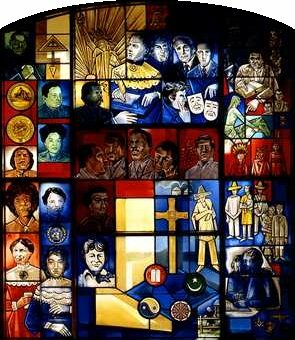 Noted Jewish-Americans, Native Americans, Hispanic Americans, African Americans, Asian Americans and women are represented as well as symbols of the major faiths of the world – “One Nation under God”. Church and State: This window mingles religious symbols with signs of democracy as we remember the words of the American Bill of Rights, “Congress shall make no law respecting establishment of religion or prohibiting the free exercise thereof.” Four American political leaders are evoked who have defended the separation of church and state, George Washington, Thomas Jefferson, John Marshall and Abraham Lincoln. The Seal of the United States is posed next to the symbols of Christianity, Judaism and Islam. America’s Laborers: “And God saw everything that he had made, and behold, it was very good.” Through our labor, we become co-creators of God’s good earth. 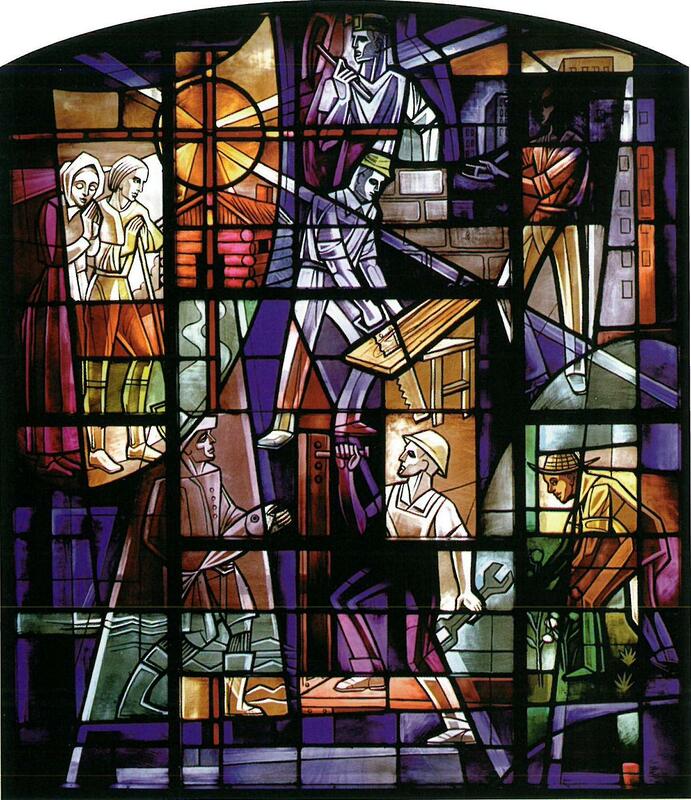 The American Laborers window commemorates the laborers of America, from the pioneers who wrested a nation from a wilderness, to today’s workers, raising crops, building cities, generating solutions to age-old problems. The Presbyterian Church: The pioneers of the Reformed Tradition in Scotland and America gather around the St. John’s Cross at Iona, the form of the cross that the New York Avenue Presbyterian Church has adopted as its own. In the words of the reformers, “always reforming, never reformed”, or in those of our late beloved pastor, Dr. Jack McClendon, “always arriving, never arrived”.